Q What's the best way to calculate the quantity? Length times width of the area to be covered will give you square footage. For most installations, add 5-7% for cutting loss, and enough to keep on hand for any repairs. When the installation is on a diagonal, or when you are using a multi-size pattern, you should add 12-15%. Q Is there any way to repair chips in the surface of a ceramic tile? Ans Yes, any good glue (epoxy based) will satisfactorily repair a ceramic tile. But that will only repair; when it comes to looks such repaired tiles don’t match up, as refinishing the surface to match the original tile is the tough part. The best thing would be to replace the chipped tiles along with those adjacent to it. Q What is laying with spacers? Tiles can be laid with readily available spacers, thereby achieving a uniform gap, and the same can be grouted with suitable grouting compounds. Q Why is a Vitrified tile superior to the ordinary Ceramic tile? The manufacturing process of the Vitrified tiles is far more superior to Ceramic tiles. 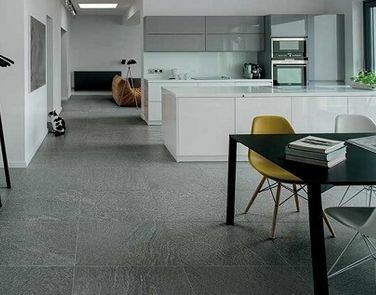 The Vitrified tiles are also homogeneous and consistent in composition. Ceramic tiles have merely a decorative coat on the top and hence their composition is not consistent. Q How do I maintain and care for Ceramic Tile? Ans No need to wax or polish glazed Tiles. Simply wiping glazed Tile with a damp sponge or sponge mop is all that is necessary for daily maintenance. In case stains persist if it is not removed with detergent, use diluted hydrochloric acid or muriatic acid. Q Can a floor tile be used on wall and vice versa? Ans We do not recommend because the floor tile is much heavier than a wall tile. It is less porous and absorbent. The chances to adhere to the vertical surface is lesser than in a wall tile. This will result in the floor tile being easily dislodged from the surface and also cracking. However it is an individual's choice if he is still ready to take risks, he can use the floor tiles on the wall. Q Is it necessary that one should use a particular design or colour or size for a particular application? Well, design, color and size preference is based on purely individual or personal choice or taste. However here are some basic guidelines and tips on selecting the right design, colour and size for different applications. The tiles you choose should match with the existing, or intending decor of the room where they are to be used. In a plain area (areas devoid of furniture, an open area), you could use a pattern type or geometric tile design. This will help generate a little fullness where none existed before. By the same a plain tile will help calm down a busy and cluttered room. Larger tiles tend to look better in larger rooms, and converse is true for smaller size tiles. Q Will ceramic tile crack or chip?